Media captionBarnier: "No-deal Brexit has become more likely"
A no-deal Brexit is now more likely but can still be avoided, the EU's chief negotiator has said. Michel Barnier said a long extension to the UK's 12 April exit date had "significant risks for the EU" and a "strong justification would be needed". Meanwhile, the BBC's John Pienaar said Theresa May's cabinet has considered plans to "ramp up" preparations for a no-deal Brexit. A snap general election was also discussed in the meeting, he said. A second two-hour regular cabinet meeting will be held later, with the issues likely to be discussed again. It comes after MPs voted on four alternatives to the PM's withdrawal deal, but none gained a majority. In the Commons votes on Monday, MPs rejected a customs union with the EU by three votes. A motion for another referendum got the most votes in favour, but still lost. The so-called indicative votes were not legally binding, but they had been billed as the moment when Parliament might finally compromise. That did not happen, and one Tory MP - Nick Boles, who was behind one of the proposals - resigned the whip in frustration. Brexit Secretary Stephen Barclay told MPs that if they wanted to secure a further delay from the EU, the government must put forward a "credible proposition". One suggestion has been the possibility of a general election - but former foreign secretary Boris Johnson told BBC political editor Laura Kuenssberg that would be likely to "infuriate" voters. Which Brexit options did your MP support on 1 April? Instead, Mr Johnson said he believed a new leader and "change in negotiation tactic" could "retrofit" the PM's "terrible" agreement with the EU. Speaking on Tuesday morning, Mr Barnier said: "No deal was never our desire or intended scenario but the EU 27 is now prepared. It becomes day after day more likely." Mr Barnier told the European Parliament's foreign affairs committee that "things are somewhat hanging on the decisions of the House of Commons", and that the deal was negotiated with the UK "not against the UK". "If we are to avoid a no-deal Brexit, there is only one way forward - they have got to vote on a deal. "There is only one treaty available - this one," he said, waving the withdrawal agreement. Former Brexit Secretary David Davis told BBC Radio 4's Today programme the way forward was to address the controversial Irish backstop - a measure to avoid the return of a hard border on the island of Ireland. He said the most "constructive outcome" would be the Malthouse Compromise - which includes extending the transition period for a year until the end of 2021 and protecting EU citizens' rights, instead of using the backstop. But the Leader of the Commons Andrea Leadsom said the prime minister's deal was the best option. "The compromise option, the one that delivers on the EU referendum but at the same time enables us to accommodate the wishes of those who wanted to remain in the EU - that is the best compromise," she said. Labour MP and chairman of the Brexit select committee Hilary Benn told Today that a confirmatory referendum was the best solution. "A good leader would be taking that decision and put it back to the people," he said. "[The] fear is that the PM is not going to move an inch. That is why we are at a moment of crisis." Mrs May's plan for the UK's departure has been rejected by MPs three times. Last week, Parliament took control of the process away from the government in order to hold a series of votes designed to find an alternative way forward. Eight options were put to MPs, but none was able to command a majority, and on Monday night, a whittled-down four were rejected too. 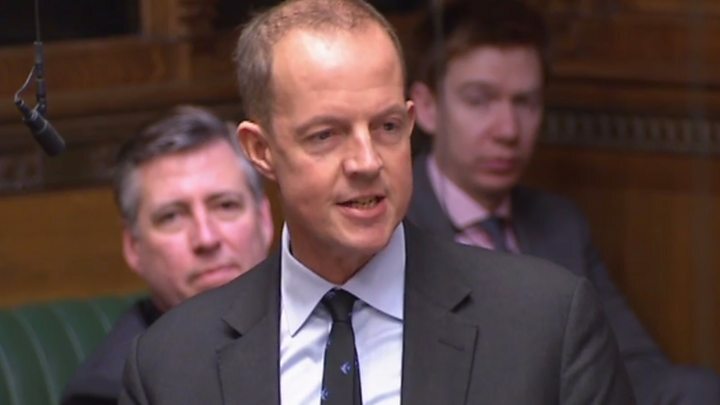 Media captionNick Boles: "I have failed, chiefly, because my party refuses to compromise"
Those pushing for a customs union argued that their option was defeated by the narrowest margin - only three votes. It would see the UK remain in the same system of tariffs - taxes - on goods as the rest of the EU, potentially simplifying the issue of the Northern Ireland border, but prevent the UK from striking independent trade deals with other countries. Those in favour of another EU referendum pointed out that the motion calling for that option received the most votes in favour, totalling 280. For months, Parliament has been saying "Let us have a say, let us find the way forward," but in the end they couldn't quite do it. Parliament doesn't know what it wants and we still have lots of different tribes and factions who aren't willing to make peace. That means that by the day, two things are becoming more likely. One, leaving the EU without a deal. And two, a general election, because we're at an impasse. One person who doesn't think that would be a good idea is former foreign secretary and Brexiteer Boris Johnson.